1) I’ve recently been named Editor for the International Lutheran Council’s (ILC) news service, a global association of confessional Lutheran church bodies. I’ll be taking on this position in addition to my current roles as Communications Manager for Lutheran Church–Canada and Editor of The Canadian Lutheran (making room for the new work by shuffling off some of my previous duties to others). For more information on what I’ll be doing with the ILC, check out this news release here. 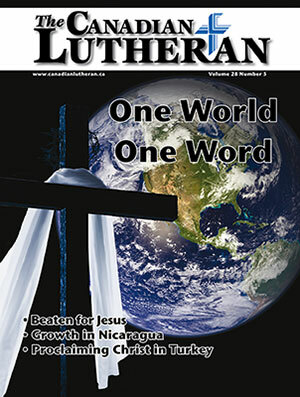 My column for the September/October issue of The Canadian Lutheran is available online. That issue of the magazine had a dual focus on international missions and remembering the Reformation. I like to think I tied together those two focuses together in a fairly coherent way in my article, reflecting on St. Paul’s teaching that our faith moves us to share the Gospel. “We believe, therefore we have spoken.” The good news of salvation through God’s grace—the Reformation truth of justification—is not something we keep to ourselves. We can’t keep it to ourselves. It bursts forth from our lips—the Good News that Christ’s death and resurrection has accomplished our salvation. Luther could not keep quiet about this discovery; the Good News that we are declared righteous through faith in the Gospel was something everyone needed to know. Like Luther, we too are motivated by the Spirit to tell others that God accepts them on the basis of Christ’s mercy, not their works. Indeed, our faith compels us to share the Gospel. St. Paul explains it well: “It is written: ‘I believed; therefore I have spoken.’ With that same spirit of faith, we also believe and therefore speak because we know that the one who raised the Lord Jesus from the dead will also raise us with Jesus and present us with you in His presence. All this is for your benefit, so that the grace that is reaching more and more people may cause thanksgiving to overflow to the glory of God” (2 Corinthians 4:13-15). Read the whole article online here: We believe, therefore we speak. Captain Thin is powered by	WordPress 5.0.4 and delivered to you in 0.436 seconds using 32 queries.